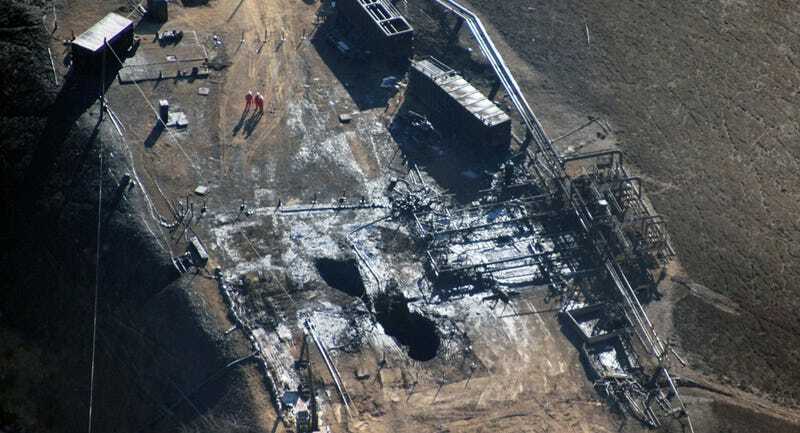 A week after the ruptured natural gas well near Porter Ranch, California was officially sealed, we have the full damage report. And it reveals that this was easily one of the largest environmental disasters in US history. All told, the leak released 97,100 metric tons of heat-trapping methane over 112 days, equivalent to the annual greenhouse gas emissions of over half a million cars, according to a scientific paper published today in Science. “This is by far the biggest [methane leak] I’ve ever seen,” said Don Blake, an atmospheric scientist at UC Irvine and a co-author on the Porter Ranch gas leak study. For those who’ve been following the saga, which began when a natural gas storage well in Aliso Canyon erupted on October 23, 2015, the total amount of methane reported in the new study may look familiar. In fact, it’s just a shade higher than the final reading on a real-time ticker the Environmental Defense Fund has maintained since December. When Stephen Conley, a scientific aviation specialist at the University of California, Davis, was asked by the California Energy Commission to conduct a flyover of Aliso Canyon on November 7, Southern California Gas Company had already reported a well leak, but nobody had any idea how big it was. That’s why, when Conley’s air sampling instruments read methane concentrations of 50 to 60 parts per million (ppm), he figured it must be a mistake. The background concentration of methane in the air is typically around 2 ppm. Once the sheer size of the leak became apparent, a state response took off. Conley began conducting regular flights over the town of Porter Ranch, tracking methane concentrations in the gas leak’s plume as it blew from the north. “Essentially we constructed a curtain downwind of the site and measured all the gas flying through that curtain,” he said. At its peak in November, a staggering 60 metric tons of methane spewed out of the ruptured well every hour. In early December, the leak began to slow down, as SoCalGas started drawing natural gas out of the leaky well and sending it to homes to relieve pressure. Still, the leak continued to spew methane until February 11, when a two-month drilling operation finally reached the well some 8,500 feet beneath the ground, and injected hydraulic fluids to temporarily plug it. Several days later, the leak was permanently sealed with cement. A small amount of methane continues to seep out of the ground—either from gases trapped in the soil, the wellhead, or an imperfect seal—and Conley says he’ll continue flying over the site until the flow rate stabilizes. For the 5,000-odd households in Porter Ranch and surrounding communities that were driven away by noxious fumes, it’s time to move back home. But for SoCalGas and other natural gas suppliers nationwide, the fallout from this incident is just beginning. That’s because the gas leak, which began with the failure of a 1950s-era pipe on a well that didn’t have a safety valve, has put a national spotlight on the problems of aging infrastructure, weak regulation, and shoddy oversight in the natural gas industry. The Aliso Canyon storage facility is by all accounts enormous: with 115 wells, it’s the largest such reservoir in the western US. But nationwide, there are approximately 400 other underground natural gas storage facilities that, like Aliso Canyon, are subject to little or no federal regulation. Instead, these facilities—many of which include decades-old and deteriorating pipes—are managed according to a patchwork of state regulations that vary widely from place to place. In California, responsibility for natural gas storage facility regulation and disaster response are divided among an “alphabet soup of at least seven different state agencies,” as Inside Climate News puts it. But the problem extends far beyond storage wells. The distribution infrastructure in many cities is also leaky, as illustrated by another analysis published this week in the Journal of Geophysical Research, which identified 213 discrete, methane emitting hotspots throughout the LA area. “Our surveys demonstrate the prevalence of unwanted methane emissions across the Los Angeles urban landscape and show that two-thirds of the gas comes from fossil fuel origins,” said Francesca Hopkins, lead author on the study. The EPA is currently finalizing national standards that would directly regulate methane emissions for the first time, but they only address pollution from future facilities, allowing storage wells like those at Aliso Canyon to continue flying under the radar. 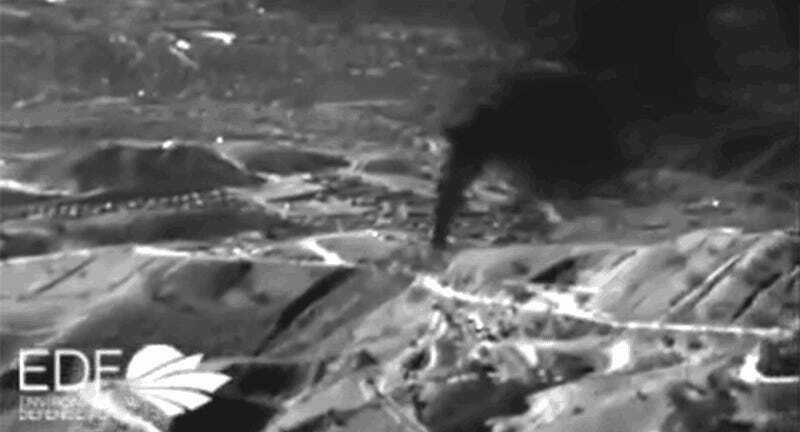 To Conley, Blake, and others involved with tracking the Aliso Canyon methane plume, the disaster has highlighted the desperate need for a coordinated, independent environmental monitoring and response system around oil and gas storage sites. “Actually having somebody involved in the analysis that doesn’t have a horse in the race is very important,” Blake said. Blake pointed out that BP’s initial estimates of the Deepwater Horizon leak rate were extremely low. Meanwhile, SoCalGas is facing a lawsuit (actually, one of many) for failing to report the leak at Aliso Canyon until three days after it began.